Community solar panel array in a field. Unfortunately, community solar is currently unavailable in West Virginia. To have community solar, your utility must agree to voluntarily participate in community solar, or be forced to allow it by state-level legislation. But with enough momentum and political power, we can change West Virginia’s policies. Solar United Neighbors helps you fight for your solar rights. Join the thousands of solar activists in your state who share your vision. Solar United Neighbors helps you fight for your solar rights. Sign up for our newsletter to learn more about how you can get involved. And, consider becoming a member. A number of states across the country have already passed legislation to allow community solar. And others are fighting for the ability to develop their own community solar projects. 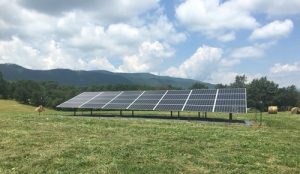 A key step to community solar is enabling power purchase agreements (PPAs). PPAs enable people to benefit from solar generation, even if they don’t own the system.